Here the pole (common) of each relay is connected to the terminals of the MOTOR. The pole is connected to two terminals- the NC and NO. Here, the NC terminal of both the relays have been connected to 12 V and the NO of both have been grounded. Clearly, when the relay isn’t activated, the pole is at 12 V and when the relay is activated, the pole is ground. When the relays are in NC state, then both terminals of the MOTOR are connected to +12V and thus, the MOTOR remains in stall condition. When one of the relays is activated say relay 1, the pole-1 is connected to the ground (NO) while pole-2 is still connected to 12 V (NC). Hence, the potential developed enables the motor to run in one direction. Similarly, when relay 1 is in NC stated and relay 2 is activated, the motor runs in the opposite direction. This way, the circuit of the motor is complete and by controlling the relays with different control line the MOTOR’s direction of rotation can be controlled. 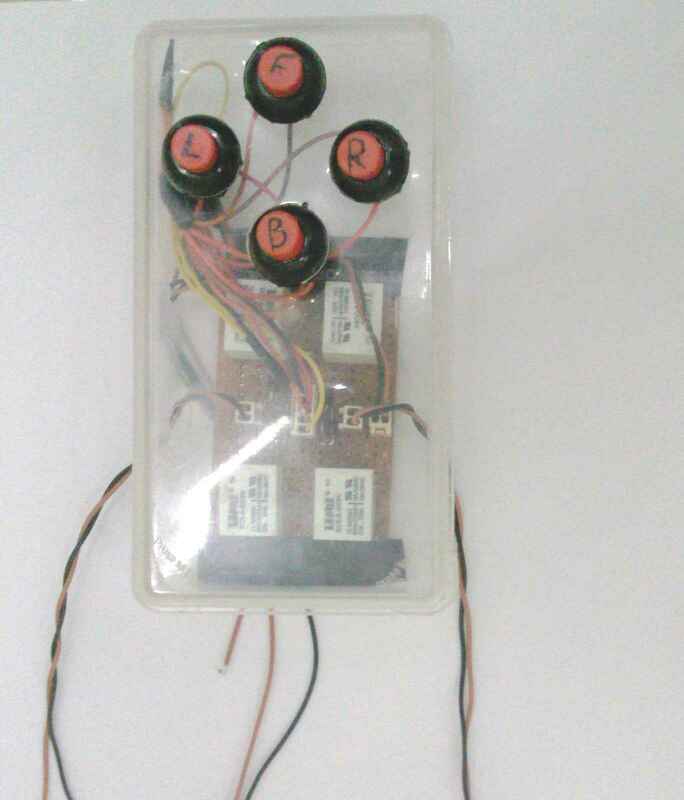 This is the Circuit of the four push buttons will be in the controlling person’s hands. How do we control the motor ? We saw that we created a relay circuit to control the rotation of the MOTOR by activating a particular relay at a time. Now we want the power coming from the push buttons to control the motor movement. The relays R1 and R2 are the relays controlling the Right MOTOR and the relays L1 and L2 are are controlling the Left MOTOR. The connector from the Push Button circuit is connected to the controller circuit as shown. Now the push buttons F,R,L,B will govern which relays will be active so as to achieve the required movement in the differential drive. It is assumed that when R1 (1) is NC and R2 is activated (0) then the Right MOTOR moves in forward direction and when R1 (0) is activated and R2 is NC(1), the motor moves in backward direction. Similar is the case with Left MOTOR. 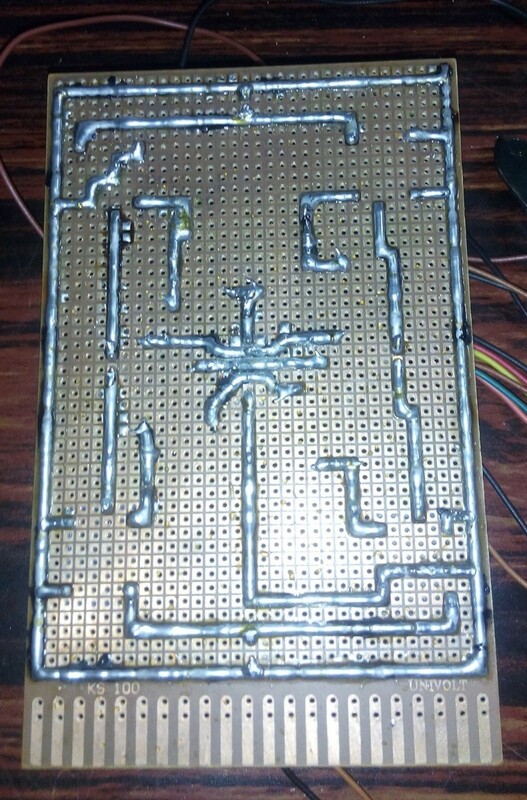 Here is an image of a complete control circuit. After putting the diodes, your control box is ready for providing the gaming experience!!! If you press L then the robot will take a zero degree Left turn and press R then the robot will take zero degree right turn. But, if you press F and R together then R1=1, R2=1 and L1=1 which means that it would simply take a right turn. All the combinations of F+L, B+R, B+L are also possible. If you press F and B together, then both the motors will stop. This is an additional feature in the four push button control box.